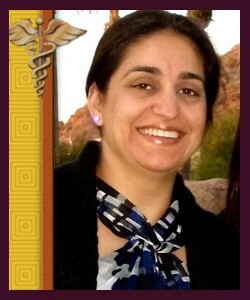 Dr. Brar graduated from the University of Southern California (USC) in 1996. She enjoys and specializes in cosmetic dentistry, pediatric, family dentistry and is also a certified Invisalign provider. Her passion for dentistry is the thriving force of her life and her patients will always be her main priority. That is the promise and commitment she makes to each of her patients. Dr. Brar loves Orange County and enjoys all that it has to offer. She has three kids and likes to spend time with her family. She also enjoys good food, traveling, watching movies, and performing community service. Dr. Brar's personable nature helps her patients through their dental work. She has been providing dental care for over 15 years with the highest standards and uncompromising safety, dedicated to excellence. She strongly believes in providing stress-free environment & pain-free dentistry. Every opportunity to relieve a patient of their physical and/ or emotional pain gives her the strength to work harder for their benefit. She has won the trust of her patients by providing a relaxing and positive experience. She takes a keen interest in latest technology developments, and her continued education each year allows her the opportunity to gain an ever greater ability to take care of her patients. Dr. Brar is a member of Orange County Dental Society, California Dental Association, American Dental Association. 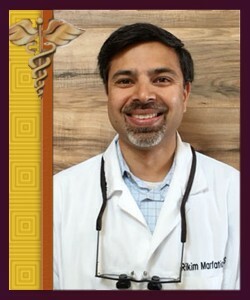 Dr. Rikim Marfatia was raised in Irvine, California. He received his Bachelors of Science from UCLA in Microbiology and Molecular Genetics in 1995. He attended dental school at the University of Southern California in Los Angeles and graduated in 2000. He has been practicing dentistry in Orange County and the surrounding areas for over 15 years. Over the years he has taken numerous continuing education courses in both general and cosmetic dentistry. He takes great pride in not only providing the highest quality of dental care but also in treating each patient as though they were a part of his own family. He is Invisalign certified. During his free time, Dr. Marfatia enjoys spending time with his wife, son, and daughter. They enjoy traveling, cycling and going to the movies.